Like so many other facets of the entertainment industry, video games manage to have a foot in both the worlds of art and business. It’s a strange marriage on paper, but without a head for business you’ll never make a living with your art. And without a healthy dose of creativity, you’ll never have a product worth selling. The question, though, is how do you decide on the right balance between the two? It’s a problem that every studio wrestles with, and Rocketship Park is no exception. Remember when the App Store looked like this? Our debut release, Block Droppin’, hit the App Store in the summer of 2017. Development started earlier in the year, and the art side of the equation was at its peak fairly early in the process. 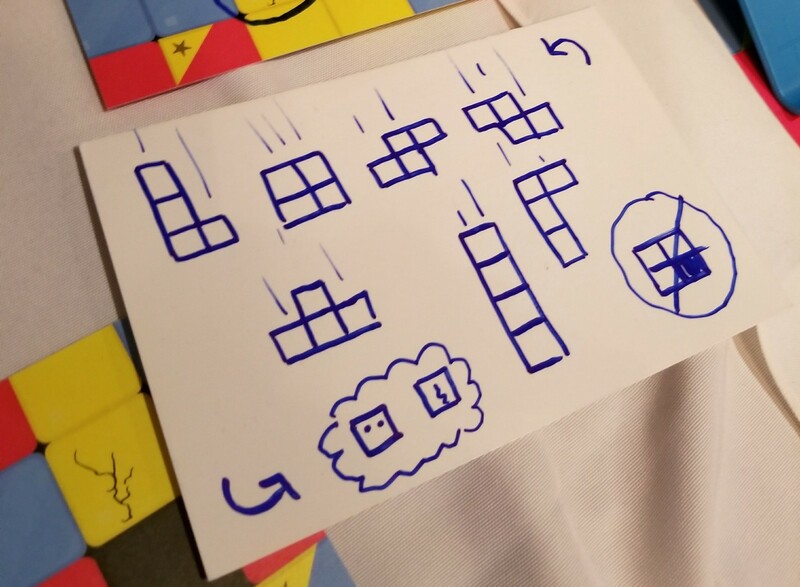 Block Droppin’ had undergone several prototypes (and even began life as a word game! ), but quickly evolved into a take on the falling blocks formula that we had never seen before. We felt that it was a deeply satisfying puzzle game, and the results from our testing group agreed. The analytics were proving out exactly what every developer dreams of: people were playing, and they weren’t stopping. While the artistic side of Block Droppin’ was absolutely shining at this stage, taking the game from addictive prototype to marketable release meant making some tough business choices; the type that had to factor in the existing climate. 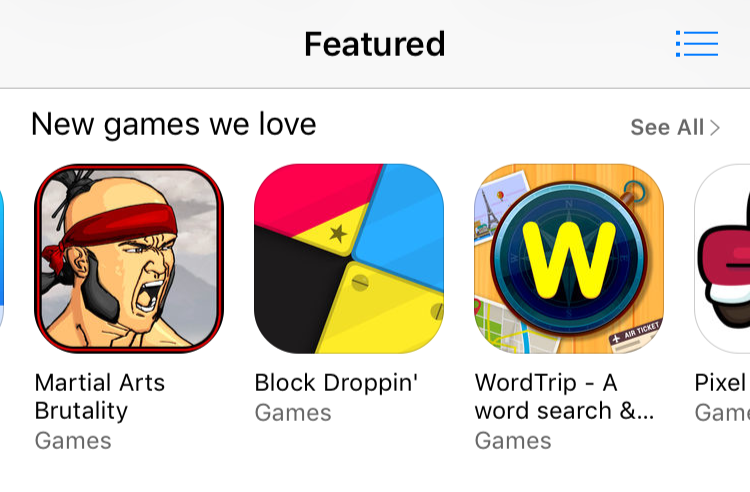 Unlike our current in-development titles (which are being designed in Unity with multiple platforms in mind), Block Droppin’ was developed natively in Xcode, and therefore laser-focused on a single marketplace: the App Store. While there was a time when premium indie games could survive (and even thrive!) on the App Store, premium success stories were almost entirely aberrations by 2017. Free-to-play, or so the prevailing logic went, was the only way money could be made on in mobile games anymore. As far as we were concerned, this was fine. Free-to-play is an area that both Shane and I had plenty of experience in, and it wasn’t hard for us to see how easily Block Droppin’ could be tucked into a free-to-play wrapper. 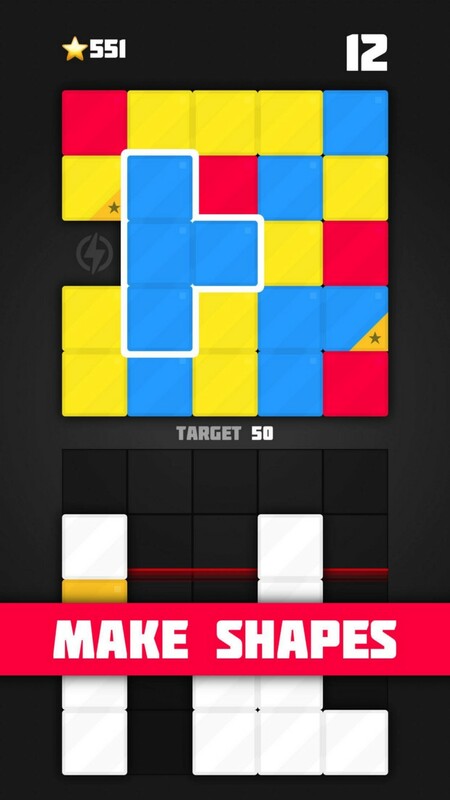 With the addition of a few power-ups, new modes, in-app purchases and rewarded videos, Block Droppin’ could hit the App Store using the same model that’s seen in the games that dominate mobile charts. 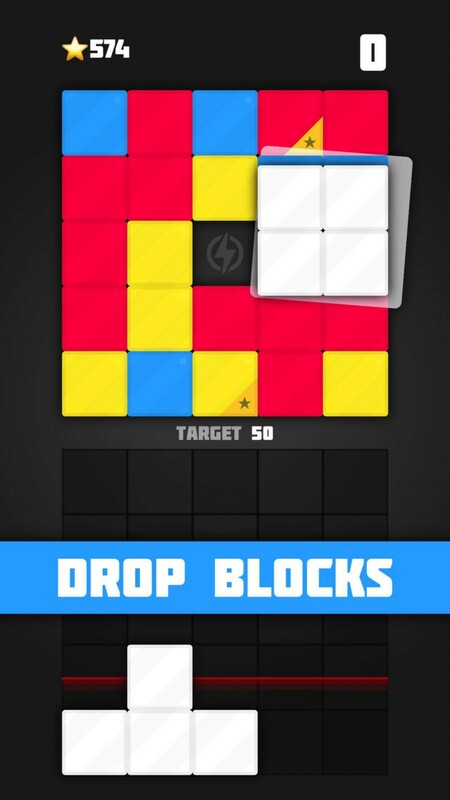 The latter might sound like a boast, but it’s actually a shameful admission of our flawed approach: Block Droppin’ is a genuinely challenging puzzle game, but by contrast, the masses want something simple. This isn’t meant to be a harsh assessment of the games that top the App Store — there are some tremendous games out there that aren’t terribly complex, and those games perform incredibly well on mobile. Block Droppin’, unfortunately, didn’t fit that mold. But Block Droppin’ is more than the sum of its parts. Asking players to juggle both aspects of play simultaneously is a surprisingly complex task. Experienced puzzle gamers — like those that were in our test group — absolutely loved it. But it was never going to have the kind of mass-market appeal that would be needed to turn a profit in the free-to-play market. This became apparent pretty quickly when we looked at our analytics after launch. We were fortunate enough to be blessed with an App Store feature in many global markets, so we had enough players in Block Droppin’s first week to get a real sense of what was happening. The vast majority of our players were giving up before completing the first level. Conversely, there was a small but notable group of players who were playing marathon sessions to complete all 200 levels. The truth was out there: Block Droppin’ may have had a niche appeal, but those who liked it really liked it. While we were mostly focused on our next title by Fall 2017, there was a part of us that really wanted to keep the Block Droppin’ dream alive. It’s really hard to reinvent an idea like falling blocks in a genuinely new way, but we’d done it — and we really believed that it was good! So on a train ride from Toronto to Montreal, we concocted and built a stripped down version of Block Droppin’ that did away with all of the elements we’d added for revenue purposes. If things were too complicated, we thought, we needed to strip the game down to its bare essentials. Gone were the extra modes and power-ups. The only thing left for monetization was a simple “watch ad to continue” option to keep players working towards their new high score. We were headed to Montreal that weekend to give a talk at the Canadian Gaming Expo (CGX), and to showcase Block Droppin’ on their expo floor. 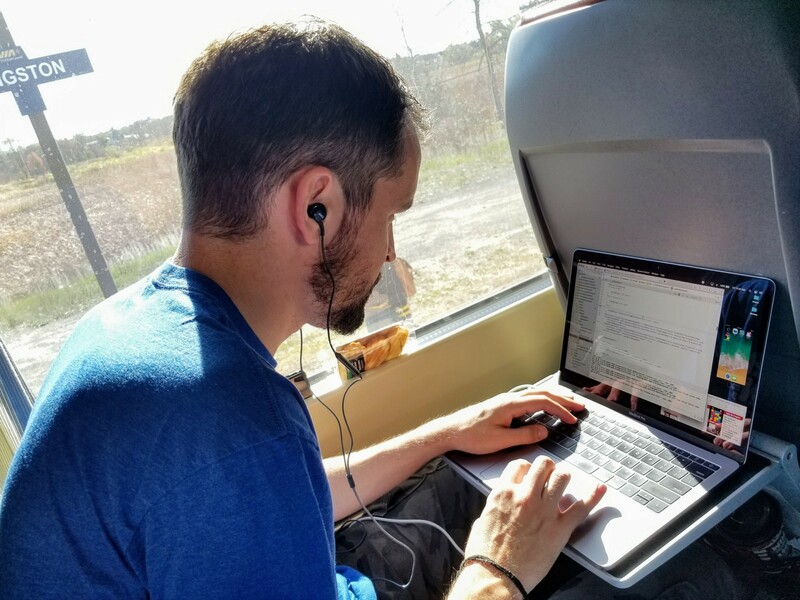 Instead of bringing the publicly-released version as planned, we spent the weekend demoing the new, stripped down version we’d made on the train — and the results were like night and day. While earlier event showcases for Block Droppin’ left some players confused, the new version had two solid days of smooth testing where players just “got it”. We were getting a consistently positive response from the crowd. But how to business it? We’ve written a lot of words here about our Block Droppin’ experience, but if you’re looking for the tl;dr, it all boils down to this: free-to-play success is determined less by a game’s quality than it is by its lack of player friction. Free-to-play games need a large marketing spend to find an audience, and publishers aren’t interested in spending money on games that won’t hold the interest of as wide a group of players as possible. I don’t blame a single other person for the struggles of Block Droppin’. I certainly don’t blame publishers for their lack of interest. The free-to-play business is business. Companies in this space want to provide the best games possible that can appeal to the largest group possible and keep them engaged, because that’s how you hedge your bets on profitability. This doesn’t mean that publishers don’t care if your game is good — it just means that “good” isn’t the sole determining factor in this space, and trading quantity of players for quality of experience is a always going to be a losing deal. Block Droppin’ should never have been a free game. As best as we can figure, this was our critical mistake. We were so horrified by what we had seen happening to premium games on the App Store that we ran as fast as we could in the other direction — and we were wrong to do it. 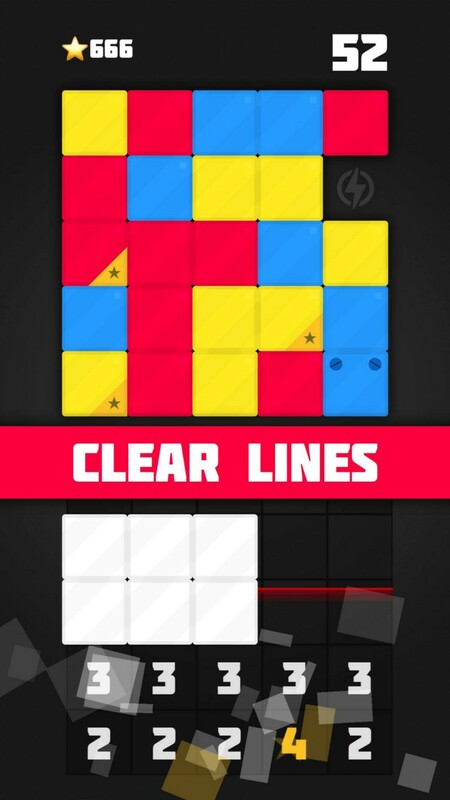 There are plenty of great premium puzzle games on the App Store aimed at players who are craving a deep, proper challenge; games that are comfortable with delivering a better experience that doesn’t compromise and know full well who their audience is. The work of grapefrukt, in particular, really stands out as a model to aspire to. Go check out twofold inc. or holedown and you’ll see what we mean. And so, in a nutshell, that’s what we’re doing. We’re re-releasing Block Droppin’ as a premium puzzle experience. Block Droppin’ is a great game, and it deserves another chance to find its audience. As of today, we’ve pulled the original Block Droppin’ from the App Store and we’ve replaced it with Block Droppin’ Blitz. The game isn’t free anymore; it’s $2.99 — and it offers a lot less than Block Droppin’ did. But we feel this makes it a whole lot better — and we think you will too. A digital design studio focused on creating unique, emotive games that eschew derivative design.